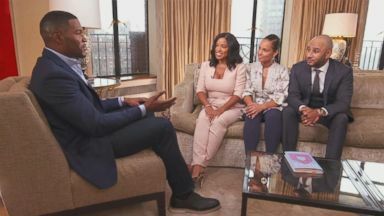 The singer-songwriter, her husband, Swizz Beatz, and his ex-wife Mashonda Tifrere, who wrote the book "Blend," discuss their difficult but ultimately joyous journey to co-parenting together. how they've mixed things up. Each of you, one word to describe your blended family. Flow. My inspiration. Notorious. Yes! Reporter: This is life today for mishonda, her ex-husband music producer swiz beats, and singer/songwriter Alicia keys. We love each other, hang out with each other, go to dinner together. Our family's one big beautiful family. We're doing Thanksgiving, we're doing the holidays, we'll do a birthday celebration together. It is a beautiful partnership. I'm very, very proud of that. It's a real thing and it's possible. Reporter: Bringing their families together didn't happen overnight. It wasn't easy. It was a roller coaster ride. A lot of prayer, a lot of meditation. Reporter: After a painful divorce, mishonda and swiz who share a son, now 11, weren't getting along. Things started off with a little bit of miscommunication, negativity. Reporter: Something that was affecting their son. He wanted to know why I couldn't go see him at his dad's and why can't his dad come over and see his bedroom at our house? It was really a wakeup call. Even if we don't want to, for ourselves right now, we have to do it for him. Because he doesn't deserve this. Reporter: Now in her new book "Blend," with the foreword by Alicia and a chapter by swiz, she shares what she learned along the difficult but ultimately joyous journey to blend their families, parents and sons. Our culture is comfortable with being miserable, being unhappy. I lived through a messy divorce with my parents. And as a child I remember the negative energy. The feeling of just not having any security in my own home. And that's just not something I wanted for our son. When you realize that, if your focus truly is the child's and the well-being of the child, that's the ultimate, like, let me fix this now. Put your ego -- Away. The ego is the biggest killer. Yeah. It's not as if you wake up and go, we're going to blend our family, it's going to be smooth, we're going to have this understanding! There was a lot of communication between you guys, mediators involved. Totally. What people don't see, and I understand. They see us here now loving each other, coexisting, getting along. But there's a whole middle that they didn't see. And that's where we all put the work in on ourselves individually. We healed. We healed our children. We gave them an opportunity to see us growing. And that's the real blend. That healing, it's the first step to blending. Reporter: A turning point in their relationship, when mishonda invited Alicia to Kassim's 6th birthday party. That was a pivotal moment. We'd been doing a lot of the work as far as communicating and consciously trying to get to a new level of humanity with each other. By the time that was transpiring, we were in a really great place. And I felt like, you know, I really -- I want Alicia to be here. Not only did she come, but she stayed until the end of the party. And that moment was our first time really hanging out together as a family. ??? What you do what you do what you do for love ??? You wrote a beautiful song "Blended family." The video, everybody together. I heard Kassim had a reaction to that. He did. It's one of my favorite songs. It's really my love song to Kassim and our experience. So we did the video. We really wanted to make it exactly what it was, which is our life together. All of us. All of his brothers, his mom, me, his only -- totally his only. Stepmom was never an option. That sounds wrong. It's too wrong. Like this bad ring to it. So omi, which is so endearing. I call Alicia umi all the time. She got me calling her umi. We came up with umi. And I was like, it's beautiful. Does this blended process ever stop? Is it something you've got to be consciously conscious of? It can't ever stop. Our children are growing. They're going to have graduations. They're going to have weddings. We're partners. Yeah. Really, we're life partners. I remember one day mishonda said to me, we're going to be grandparents together. And I was like, wow. We're going to share -- I mean, it's worth it. People don't think that far ahead. We're going to share grandbabies. It's that real. It gives me chills right now. It makes so much sense, it's so beautiful. ??? A blended family ??? The singer, her husband Swizz Beatz, and Beatz's ex-wife discuss raising their children as co-parents, and say they even spend holidays together. 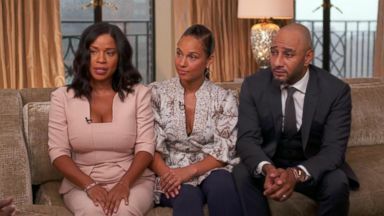 In her new book "Blend," Mashonda Tifrere chronicles her journey to co-parenting with her ex-husband, Swizz Beatz, and his wife, singer-songwriter Alicia Keys. After releasing her second album "The Diary of Alicia Keys," the singer opens up about other projects she hopes to work on.